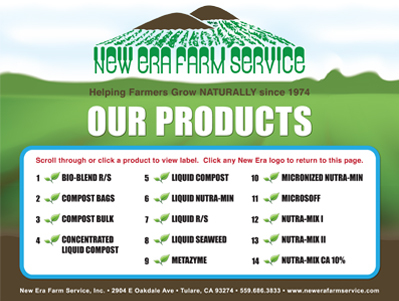 -- is a soluble extract derived from composted dairy manure that has gone through a thermophillic controlled biological oxidative process plus ocean-going fish, humic acid derivatives, seaweed extract, yucca schidigera, cane molasses. It can be applied to soil, metered through irrigation systems, and applied to foliage. New Era Root Stimulant has been shown to stimulate better root systems that can increase the efficiency of applied and existing nutrients.